Mix first 3 ingredients until blended. Combine chicken, cheese and peppers in large bowl. Add mayo mixture; mix lightly. Unroll crescent dough on baking sheet sprayed with cooking spray; firmly press perforations and seams together to form 12x8-inch rectangle. Spread chicken mixture onto dough to within 2 inches of edges. Use kitchen shears or sharp knife to make cuts, 1 inch apart, on long sides of dough to within 1/2 inch of filling. Pull strips up over filling, crisscrossing dough in center. 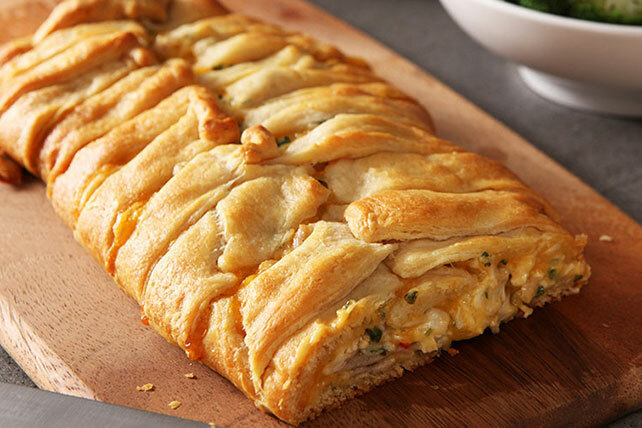 Save 90 calories and 10g of total fat, including 3g of sat fat, per serving by preparing with KRAFT Light Mayo Reduced Fat Mayonnaise, KRAFT 2% Milk Shredded Cheddar Cheese and refrigerated reduced-fat crescent dinner rolls. Pair this entrée with smart sides, such as steamed broccoli and a side salad tossed with your favorite KRAFT Lite Dressing. The chicken mixture can be prepared in advance. Store in refrigerator up to 24 hours before using as directed.